For other uses, see Elizabeth II (disambiguation). Elizabeth was born in London as the first child of the Duke and Duchess of York, later King George VI and Queen Elizabeth, and she was educated privately at home. Her father acceded to the throne on the abdication of his brother King Edward VIII in 1936, from which time she was the heir presumptive. She began to undertake public duties during the Second World War, serving in the Auxiliary Territorial Service. In 1947, she married Prince Philip, Duke of Edinburgh, a former prince of Greece and Denmark, with whom she has four children: Charles, Prince of Wales; Anne, Princess Royal; Prince Andrew, Duke of York; and Prince Edward, Earl of Wessex. 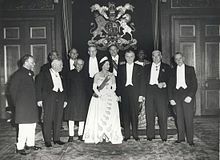 When her father died in February 1952, she became head of the Commonwealth and queen regnant of seven independent Commonwealth countries: the United Kingdom, Canada, Australia, New Zealand, South Africa, Pakistan and Ceylon. She has reigned as a constitutional monarch through major political changes, such as devolution in the United Kingdom, Canadian patriation, and the decolonisation of Africa. Between 1956 and 1992, the number of her realms varied as territories gained independence and realms, including South Africa, Pakistan, and Ceylon (renamed Sri Lanka), became republics. Her many historic visits and meetings include a state visit to the Republic of Ireland and visits to or from five popes. Significant events have included her coronation in 1953 and the celebrations of her Silver, Golden, and Diamond Jubilees in 1977, 2002, and 2012 respectively. In 2017, she became the first British monarch to reach a Sapphire Jubilee. She is the longest-lived and longest-reigning British monarch as well as the world's longest-reigning queen regnant and female head of state, the oldest and longest-reigning current monarch and the longest-serving current head of state. Elizabeth has occasionally faced republican sentiments and press criticism of the royal family, in particular after the breakdown of her children's marriages, her annus horribilis in 1992 and the death in 1997 of her former daughter-in-law Diana, Princess of Wales. However, support for the monarchy has consistently been and remains high, as does her personal popularity. Elizabeth was born at 02:40 (GMT) on 21 April 1926, during the reign of her paternal grandfather, King George V. Her father, the Duke of York (later King George VI), was the second son of the King. Her mother, the Duchess of York (later Queen Elizabeth), was the youngest daughter of Scottish aristocrat the Earl of Strathmore and Kinghorne. She was delivered by Caesarean section at her maternal grandfather's London house: 17 Bruton Street, Mayfair. She was baptised by the Anglican Archbishop of York, Cosmo Gordon Lang, in the private chapel of Buckingham Palace on 29 May,[c] and named Elizabeth after her mother, Alexandra after George V's mother, who had died six months earlier, and Mary after her paternal grandmother. Called "Lilibet" by her close family, based on what she called herself at first, she was cherished by her grandfather George V, and during his serious illness in 1929 her regular visits were credited in the popular press and by later biographers with raising his spirits and aiding his recovery. Elizabeth's only sibling, Princess Margaret, was born in 1930. The two princesses were educated at home under the supervision of their mother and their governess, Marion Crawford. Lessons concentrated on history, language, literature and music. Crawford published a biography of Elizabeth and Margaret's childhood years entitled The Little Princesses in 1950, much to the dismay of the royal family. The book describes Elizabeth's love of horses and dogs, her orderliness, and her attitude of responsibility. Others echoed such observations: Winston Churchill described Elizabeth when she was two as "a character. She has an air of authority and reflectiveness astonishing in an infant." Her cousin Margaret Rhodes described her as "a jolly little girl, but fundamentally sensible and well-behaved". During her grandfather's reign, Elizabeth was third in the line of succession to the throne, behind her uncle Edward and her father. Although her birth generated public interest, she was not expected to become queen, as Edward was still young. Many people believed he would marry and have children of his own. When her grandfather died in 1936 and her uncle succeeded as Edward VIII, she became second-in-line to the throne, after her father. Later that year, Edward abdicated, after his proposed marriage to divorced socialite Wallis Simpson provoked a constitutional crisis. Consequently, Elizabeth's father became king, and she became heir presumptive. If her parents had had a later son, she would have lost her position as first-in-line, as her brother would have been heir apparent and above her in the line of succession. Elizabeth received private tuition in constitutional history from Henry Marten, Vice-Provost of Eton College, and learned French from a succession of native-speaking governesses. A Girl Guides company, the 1st Buckingham Palace Company, was formed specifically so she could socialise with girls her own age. Later, she was enrolled as a Sea Ranger. In 1939, Elizabeth's parents toured Canada and the United States. As in 1927, when her parents had toured Australia and New Zealand, Elizabeth remained in Britain, since her father thought her too young to undertake public tours. Elizabeth "looked tearful" as her parents departed. They corresponded regularly, and she and her parents made the first royal transatlantic telephone call on 18 May. In September 1939, Britain entered the Second World War. Lord Hailsham suggested that the two princesses should be evacuated to Canada to avoid the frequent aerial bombing. This was rejected by Elizabeth's mother, who declared, "The children won't go without me. I won't leave without the King. And the King will never leave." Princesses Elizabeth and Margaret stayed at Balmoral Castle, Scotland, until Christmas 1939, when they moved to Sandringham House, Norfolk. From February to May 1940, they lived at Royal Lodge, Windsor, until moving to Windsor Castle, where they lived for most of the next five years. At Windsor, the princesses staged pantomimes at Christmas in aid of the Queen's Wool Fund, which bought yarn to knit into military garments. In 1940, the 14-year-old Elizabeth made her first radio broadcast during the BBC's Children's Hour, addressing other children who had been evacuated from the cities. She stated: "We are trying to do all we can to help our gallant sailors, soldiers and airmen, and we are trying, too, to bear our share of the danger and sadness of war. We know, every one of us, that in the end all will be well." 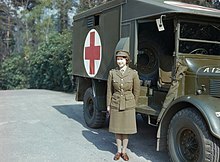 In 1943, Elizabeth undertook her first solo public appearance on a visit to the Grenadier Guards, of which she had been appointed colonel the previous year. As she approached her 18th birthday, parliament changed the law so she could act as one of five Counsellors of State in the event of her father's incapacity or absence abroad, such as his visit to Italy in July 1944. In February 1945, she was appointed as an honorary second subaltern in the Auxiliary Territorial Service with the service number of 230873. She trained as a driver and mechanic and was given the rank of honorary junior commander five months later. At the end of the war in Europe, on Victory in Europe Day, Princesses Elizabeth and Margaret mingled anonymously with the celebratory crowds in the streets of London. Elizabeth later said in a rare interview, "We asked my parents if we could go out and see for ourselves. I remember we were terrified of being recognised ... I remember lines of unknown people linking arms and walking down Whitehall, all of us just swept along on a tide of happiness and relief." During the war, plans were drawn up to quell Welsh nationalism by affiliating Elizabeth more closely with Wales. Proposals, such as appointing her Constable of Caernarfon Castle or a patron of Urdd Gobaith Cymru (the Welsh League of Youth), were abandoned for several reasons, including fear of associating Elizabeth with conscientious objectors in the Urdd at a time when Britain was at war. Welsh politicians suggested she be made Princess of Wales on her 18th birthday. Home Secretary, Herbert Morrison supported the idea, but the King rejected it because he felt such a title belonged solely to the wife of a Prince of Wales and the Prince of Wales had always been the heir apparent. In 1946, she was inducted into the Welsh Gorsedd of Bards at the National Eisteddfod of Wales. Princess Elizabeth went in 1947 on her first overseas tour, accompanying her parents through southern Africa. During the tour, in a broadcast to the British Commonwealth on her 21st birthday, she made the following pledge: "I declare before you all that my whole life, whether it be long or short, shall be devoted to your service and the service of our great imperial family to which we all belong." Elizabeth met her future husband, Prince Philip of Greece and Denmark, in 1934 and 1937. They are second cousins once removed through King Christian IX of Denmark and third cousins through Queen Victoria. After another meeting at the Royal Naval College in Dartmouth in July 1939, Elizabeth—though only 13 years old—said she fell in love with Philip, and they began to exchange letters. She was 21 when their engagement was officially announced on 9 July 1947. The engagement was not without controversy; Philip had no financial standing, was foreign-born (though a British subject who had served in the Royal Navy throughout the Second World War), and had sisters who had married German noblemen with Nazi links. Marion Crawford wrote, "Some of the King's advisors did not think him good enough for her. He was a prince without a home or kingdom. Some of the papers played long and loud tunes on the string of Philip's foreign origin." Later biographies reported Elizabeth's mother initially opposed the union, dubbing Philip "The Hun". In later life, however, the Queen Mother told biographer Tim Heald that Philip was "an English gentleman". Before the marriage, Philip renounced his Greek and Danish titles, officially converted from Greek Orthodoxy to Anglicanism, and adopted the style Lieutenant Philip Mountbatten, taking the surname of his mother's British family. Just before the wedding, he was created Duke of Edinburgh and granted the style His Royal Highness. Elizabeth and Philip were married on 20 November 1947 at Westminster Abbey. They received 2,500 wedding gifts from around the world. Because Britain had not yet completely recovered from the devastation of the war, Elizabeth required ration coupons to buy the material for her gown, which was designed by Norman Hartnell. In post-war Britain, it was not acceptable for the Duke of Edinburgh's German relations, including his three surviving sisters, to be invited to the wedding. The Duke of Windsor, formerly King Edward VIII, was not invited either. Elizabeth gave birth to her first child, Prince Charles, on 14 November 1948. One month earlier, the King had issued letters patent allowing her children to use the style and title of a royal prince or princess, to which they otherwise would not have been entitled as their father was no longer a royal prince. A second child, Princess Anne, was born in 1950. Following their wedding, the couple leased Windlesham Moor, near Windsor Castle, until July 1949, when they took up residence at Clarence House in London. At various times between 1949 and 1951, the Duke of Edinburgh was stationed in the British Crown Colony of Malta as a serving Royal Navy officer. He and Elizabeth lived intermittently in Malta for several months at a time in the hamlet of Gwardamanġa, at Villa Guardamangia, the rented home of Philip's uncle, Lord Mountbatten. The children remained in Britain. During 1951, George VI's health declined, and Elizabeth frequently stood in for him at public events. When she toured Canada and visited President Harry S. Truman in Washington, D.C., in October 1951, her private secretary, Martin Charteris, carried a draft accession declaration in case the King died while she was on tour. In early 1952, Elizabeth and Philip set out for a tour of Australia and New Zealand by way of Kenya. On 6 February 1952, they had just returned to their Kenyan home, Sagana Lodge, after a night spent at Treetops Hotel, when word arrived of the death of the King and consequently Elizabeth's immediate accession to the throne. Philip broke the news to the new queen. Martin Charteris asked her to choose a regnal name; she chose to remain Elizabeth, "of course". She was proclaimed queen throughout her realms and the royal party hastily returned to the United Kingdom. She and the Duke of Edinburgh moved into Buckingham Palace. With Elizabeth's accession, it seemed probable the royal house would bear her husband's name, in line with the custom of a wife taking her husband's surname on marriage. The Duke of Edinburgh's uncle, Lord Mountbatten, advocated the name House of Mountbatten. Philip suggested House of Edinburgh, after his ducal title. The British Prime Minister, Winston Churchill, and Elizabeth's grandmother, Queen Mary, favoured the retention of the House of Windsor, and so on 9 April 1952 Elizabeth issued a declaration that Windsor would continue to be the name of the royal house. The Duke complained, "I am the only man in the country not allowed to give his name to his own children." In 1960, after the death of Queen Mary in 1953 and the resignation of Churchill in 1955, the surname Mountbatten-Windsor was adopted for Philip and Elizabeth's male-line descendants who do not carry royal titles. Amid preparations for the coronation, Princess Margaret told her sister she wished to marry Peter Townsend, a divorcé‚ 16 years Margaret's senior, with two sons from his previous marriage. The Queen asked them to wait for a year; in the words of Martin Charteris, "the Queen was naturally sympathetic towards the Princess, but I think she thought—she hoped—given time, the affair would peter out." Senior politicians were against the match and the Church of England did not permit remarriage after divorce. If Margaret had contracted a civil marriage, she would have been expected to renounce her right of succession. Eventually, she decided to abandon her plans with Townsend. In 1960, she married Antony Armstrong-Jones, who was created Earl of Snowdon the following year. They divorced in 1978; she did not remarry. Despite the death of Queen Mary on 24 March, the coronation on 2 June 1953 went ahead as planned, as Mary had asked before she died. 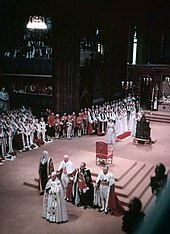 The ceremony in Westminster Abbey, with the exception of the anointing and communion, was televised for the first time. [d] Elizabeth's coronation gown was embroidered on her instructions with the floral emblems of Commonwealth countries: English Tudor rose; Scots thistle; Welsh leek; Irish shamrock; Australian wattle; Canadian maple leaf; New Zealand silver fern; South African protea; lotus flowers for India and Ceylon; and Pakistan's wheat, cotton, and jute. From Elizabeth's birth onwards, the British Empire continued its transformation into the Commonwealth of Nations. By the time of her accession in 1952, her role as head of multiple independent states was already established. In 1953, the Queen and her husband embarked on a seven-month round-the-world tour, visiting 13 countries and covering more than 40,000 miles by land, sea and air. She became the first reigning monarch of Australia and New Zealand to visit those nations. During the tour, crowds were immense; three-quarters of the population of Australia were estimated to have seen her. Throughout her reign, the Queen has made hundreds of state visits to other countries and tours of the Commonwealth; she is the most widely travelled head of state. In 1956, the British and French prime ministers, Sir Anthony Eden and Guy Mollet, discussed the possibility of France joining the Commonwealth. The proposal was never accepted and the following year France signed the Treaty of Rome, which established the European Economic Community, the precursor to the European Union. In November 1956, Britain and France invaded Egypt in an ultimately unsuccessful attempt to capture the Suez Canal. Lord Mountbatten claimed the Queen was opposed to the invasion, though Eden denied it. Eden resigned two months later. The absence of a formal mechanism within the Conservative Party for choosing a leader meant that, following Eden's resignation, it fell to the Queen to decide whom to commission to form a government. Eden recommended she consult Lord Salisbury, the Lord President of the Council. Lord Salisbury and Lord Kilmuir, the Lord Chancellor, consulted the British Cabinet, Winston Churchill, and the Chairman of the backbench 1922 Committee, resulting in the Queen appointing their recommended candidate: Harold Macmillan. The Suez crisis and the choice of Eden's successor led in 1957 to the first major personal criticism of the Queen. In a magazine, which he owned and edited, Lord Altrincham accused her of being "out of touch". Altrincham was denounced by public figures and slapped by a member of the public appalled by his comments. Six years later, in 1963, Macmillan resigned and advised the Queen to appoint the Earl of Home as prime minister, advice she followed. The Queen again came under criticism for appointing the prime minister on the advice of a small number of ministers or a single minister. In 1965, the Conservatives adopted a formal mechanism for electing a leader, thus relieving her of involvement. In 1957, she made a state visit to the United States, where she addressed the United Nations General Assembly on behalf of the Commonwealth. On the same tour, she opened the 23rd Canadian Parliament, becoming the first monarch of Canada to open a parliamentary session. Two years later, solely in her capacity as Queen of Canada, she revisited the United States and toured Canada. In 1961, she toured Cyprus, India, Pakistan, Nepal, and Iran. On a visit to Ghana the same year, she dismissed fears for her safety, even though her host, President Kwame Nkrumah, who had replaced her as head of state, was a target for assassins. Harold Macmillan wrote, "The Queen has been absolutely determined all through ... She is impatient of the attitude towards her to treat her as ... a film star ... She has indeed 'the heart and stomach of a man' ... She loves her duty and means to be a Queen." Before her tour through parts of Quebec in 1964, the press reported extremists within the Quebec separatist movement were plotting Elizabeth's assassination. No attempt was made, but a riot did break out while she was in Montreal; the Queen's "calmness and courage in the face of the violence" was noted. Elizabeth's pregnancies with Princes Andrew and Edward, in 1959 and 1963, mark the only times she has not performed the State Opening of the British parliament during her reign. In addition to performing traditional ceremonies, she also instituted new practices. Her first royal walkabout, meeting ordinary members of the public, took place during a tour of Australia and New Zealand in 1970. The 1960s and 1970s saw an acceleration in the decolonisation of Africa and the Caribbean. Over 20 countries gained independence from Britain as part of a planned transition to self-government. In 1965, however, the Rhodesian Prime Minister, Ian Smith, in opposition to moves towards majority rule, unilaterally declared independence while expressing "loyalty and devotion" to Elizabeth. Although the Queen formally dismissed him, and the international community applied sanctions against Rhodesia, his regime survived for over a decade. As Britain's ties to its former empire weakened, the British government sought entry to the European Community, a goal it achieved in 1973. In February 1974, the British Prime Minister, Edward Heath, advised the Queen to call a general election in the middle of her tour of the Austronesian Pacific Rim, requiring her to fly back to Britain. The election resulted in a hung parliament; Heath's Conservatives were not the largest party, but could stay in office if they formed a coalition with the Liberals. Heath only resigned when discussions on forming a coalition foundered, after which the Queen asked the Leader of the Opposition, Labour's Harold Wilson, to form a government. A year later, at the height of the 1975 Australian constitutional crisis, the Australian Prime Minister, Gough Whitlam, was dismissed from his post by Governor-General Sir John Kerr, after the Opposition-controlled Senate rejected Whitlam's budget proposals. As Whitlam had a majority in the House of Representatives, Speaker Gordon Scholes appealed to the Queen to reverse Kerr's decision. She declined, saying she would not interfere in decisions reserved by the Constitution of Australia for the governor-general. The crisis fuelled Australian republicanism. In 1977, Elizabeth marked the Silver Jubilee of her accession. Parties and events took place throughout the Commonwealth, many coinciding with her associated national and Commonwealth tours. The celebrations re-affirmed the Queen's popularity, despite virtually coincident negative press coverage of Princess Margaret's separation from her husband. In 1978, the Queen endured a state visit to the United Kingdom by Romania's communist leader, Nicolae Ceaușescu, and his wife, Elena, though privately she thought they had "blood on their hands". The following year brought two blows: one was the unmasking of Anthony Blunt, former Surveyor of the Queen's Pictures, as a communist spy; the other was the assassination of her relative and in-law Lord Mountbatten by the Provisional Irish Republican Army. According to Paul Martin, Sr., by the end of the 1970s the Queen was worried the Crown "had little meaning for" Pierre Trudeau, the Canadian Prime Minister. Tony Benn said the Queen found Trudeau "rather disappointing". Trudeau's supposed republicanism seemed to be confirmed by his antics, such as sliding down banisters at Buckingham Palace and pirouetting behind the Queen's back in 1977, and the removal of various Canadian royal symbols during his term of office. In 1980, Canadian politicians sent to London to discuss the patriation of the Canadian constitution found the Queen "better informed ... than any of the British politicians or bureaucrats". She was particularly interested after the failure of Bill C-60, which would have affected her role as head of state. Patriation removed the role of the British parliament from the Canadian constitution, but the monarchy was retained. Trudeau said in his memoirs that the Queen favoured his attempt to reform the constitution and that he was impressed by "the grace she displayed in public" and "the wisdom she showed in private". 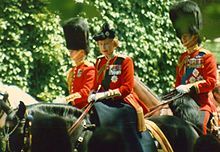 During the 1981 Trooping the Colour ceremony, six weeks before the wedding of Prince Charles and Lady Diana Spencer, six shots were fired at the Queen from close range as she rode down The Mall on her horse, Burmese. Police later discovered the shots were blanks. The 17-year-old assailant, Marcus Sarjeant, was sentenced to five years in prison and released after three. The Queen's composure and skill in controlling her mount were widely praised. Months later, in October, the Queen was the subject of another attack while on a visit to Dunedin, New Zealand. New Zealand Security Intelligence Service documents declassified in 2018 revealed that 17-year-old Christopher John Lewis fired a shot with a .22 rifle from the fifth floor of a building overlooking the parade, but missed. Lewis was arrested, but never charged with attempted murder or treason, and sentenced to three years in jail for unlawful possession and discharge of a firearm. Two years into his sentence, he attempted to escape a psychiatric hospital in order to assassinate Charles, who was visiting the country with Diana and their son Prince William. From April to September 1982, the Queen was anxious but proud of her son, Prince Andrew, who was serving with British forces during the Falklands War. On 9 July, the Queen awoke in her bedroom at Buckingham Palace to find an intruder, Michael Fagan, in the room with her. In a serious lapse of security, assistance only arrived after two calls to the Palace police switchboard. After hosting US President Ronald Reagan at Windsor Castle in 1982 and visiting his California ranch in 1983, the Queen was angered when his administration ordered the invasion of Grenada, one of her Caribbean realms, without informing her. Intense media interest in the opinions and private lives of the royal family during the 1980s led to a series of sensational stories in the press, not all of which were entirely true. As Kelvin MacKenzie, editor of The Sun, told his staff: "Give me a Sunday for Monday splash on the Royals. Don't worry if it's not true—so long as there's not too much of a fuss about it afterwards." Newspaper editor Donald Trelford wrote in The Observer of 21 September 1986: "The royal soap opera has now reached such a pitch of public interest that the boundary between fact and fiction has been lost sight of ... it is not just that some papers don't check their facts or accept denials: they don't care if the stories are true or not." It was reported, most notably in The Sunday Times of 20 July 1986, that the Queen was worried that Margaret Thatcher's economic policies fostered social divisions and was alarmed by high unemployment, a series of riots, the violence of a miners' strike, and Thatcher's refusal to apply sanctions against the apartheid regime in South Africa. The sources of the rumours included royal aide Michael Shea and Commonwealth Secretary-General Shridath Ramphal, but Shea claimed his remarks were taken out of context and embellished by speculation. Thatcher reputedly said the Queen would vote for the Social Democratic Party—Thatcher's political opponents. Thatcher's biographer John Campbell claimed "the report was a piece of journalistic mischief-making". Belying reports of acrimony between them, Thatcher later conveyed her personal admiration for the Queen, and the Queen gave two honours in her personal gift—membership in the Order of Merit and the Order of the Garter—to Thatcher after her replacement as prime minister by John Major. Former Canadian Prime Minister Brian Mulroney said Elizabeth was a "behind the scenes force" in ending apartheid. By the end of the 1980s, the Queen had become the target of satire. The involvement of younger members of the royal family in the charity game show It's a Royal Knockout in 1987 was ridiculed. In Canada, Elizabeth publicly supported politically divisive constitutional amendments, prompting criticism from opponents of the proposed changes, including Pierre Trudeau. The same year, the elected Fijian government was deposed in a military coup. As monarch of Fiji, Elizabeth supported the attempts of the Governor-General, Ratu Sir Penaia Ganilau, to assert executive power and negotiate a settlement. Coup leader Sitiveni Rabuka deposed Ganilau and declared Fiji a republic. In 1991, in the wake of coalition victory in the Gulf War, the Queen became the first British monarch to address a joint meeting of the United States Congress. In a speech on 24 November 1992, to mark the 40th anniversary of her accession, Elizabeth called 1992 her annus horribilis, meaning horrible year. Republican feeling in Britain had risen because of press estimates of the Queen's private wealth—which were contradicted by the Palace—and reports of affairs and strained marriages among her extended family. 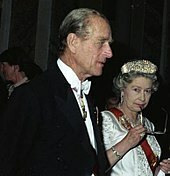 In March, her second son, Prince Andrew, and his wife, Sarah, separated; in April, her daughter, Princess Anne, divorced Captain Mark Phillips; during a state visit to Germany in October, angry demonstrators in Dresden threw eggs at her; and, in November, a large fire broke out at Windsor Castle, one of her official residences. The monarchy came under increased criticism and public scrutiny. In an unusually personal speech, the Queen said that any institution must expect criticism, but suggested it be done with "a touch of humour, gentleness and understanding". Two days later, the Prime Minister, John Major, announced reforms to the royal finances planned since the previous year, including the Queen paying income tax from 1993 onwards, and a reduction in the civil list. In December, Prince Charles and his wife, Diana, formally separated. The year ended with a lawsuit as the Queen sued The Sun newspaper for breach of copyright when it published the text of her annual Christmas message two days before it was broadcast. The newspaper was forced to pay her legal fees and donated £200,000 to charity. In the years to follow, public revelations on the state of Charles and Diana's marriage continued. Even though support for republicanism in Britain seemed higher than at any time in living memory, republicanism was still a minority viewpoint, and the Queen herself had high approval ratings. Criticism was focused on the institution of the monarchy itself and the Queen's wider family rather than her own behaviour and actions. In consultation with her husband and the Prime Minister, John Major, as well as the Archbishop of Canterbury, George Carey, and her private secretary, Robert Fellowes, she wrote to Charles and Diana at the end of December 1995, saying a divorce was desirable. In August 1997, a year after the divorce, Diana was killed in a car crash in Paris. The Queen was on holiday with her extended family at Balmoral. Diana's two sons by Charles—Princes William and Harry—wanted to attend church and so the Queen and Prince Philip took them that morning. After that single public appearance, for five days the Queen and the Duke shielded their grandsons from the intense press interest by keeping them at Balmoral where they could grieve in private, but the royal family's seclusion and the failure to fly a flag at half-mast over Buckingham Palace caused public dismay. Pressured by the hostile reaction, the Queen agreed to return to London and do a live television broadcast on 5 September, the day before Diana's funeral. In the broadcast, she expressed admiration for Diana and her feelings "as a grandmother" for the two princes. As a result, much of the public hostility evaporated. In November 1997, the Queen and her husband held a reception at Banqueting House to mark their golden wedding anniversary. She made a speech and praised Philip for his role as a consort, referring to him as "my strength and stay". In 2002, Elizabeth marked her Golden Jubilee. Her sister and mother died in February and March respectively, and the media speculated whether the Jubilee would be a success or a failure. She again undertook an extensive tour of her realms, which began in Jamaica in February, where she called the farewell banquet "memorable" after a power cut plunged the King's House, the official residence of the governor-general, into darkness. As in 1977, there were street parties and commemorative events, and monuments were named to honour the occasion. A million people attended each day of the three-day main Jubilee celebration in London, and the enthusiasm shown by the public for the Queen was greater than many journalists had expected. Though generally healthy throughout her life, in 2003 she had keyhole surgery on both knees. In October 2006, she missed the opening of the new Emirates Stadium because of a strained back muscle that had been troubling her since the summer. In May 2007, The Daily Telegraph, citing unnamed sources, reported the Queen was "exasperated and frustrated" by the policies of the British Prime Minister, Tony Blair, that she was concerned the British Armed Forces were overstretched in Iraq and Afghanistan, and that she had raised concerns over rural and countryside issues with Blair. She was, however, said to admire Blair's efforts to achieve peace in Northern Ireland. She became the first British monarch to celebrate a diamond wedding anniversary in November 2007. On 20 March 2008, at the Church of Ireland St Patrick's Cathedral, Armagh, the Queen attended the first Maundy service held outside England and Wales. The Queen addressed the United Nations for a second time in 2010, again in her capacity as Queen of all Commonwealth realms and Head of the Commonwealth. The UN Secretary General, Ban Ki-moon, introduced her as "an anchor for our age". During her visit to New York, which followed a tour of Canada, she officially opened a memorial garden for British victims of the September 11 attacks. The Queen's visit to Australia in October 2011—her 16th visit since 1954—was called her "farewell tour" in the press because of her age. By invitation of the Irish President, Mary McAleese, the Queen made the first state visit to the Republic of Ireland by a British monarch in May 2011. In this special year, as I dedicate myself anew to your service, I hope we will all be reminded of the power of togetherness and the convening strength of family, friendship and good neighbourliness ... I hope also that this Jubilee year will be a time to give thanks for the great advances that have been made since 1952 and to look forward to the future with clear head and warm heart. She and her husband undertook an extensive tour of the United Kingdom, while her children and grandchildren embarked on royal tours of other Commonwealth states on her behalf. On 4 June, Jubilee beacons were lit around the world. In November, the Queen and her husband celebrated their sapphire wedding anniversary. On 18 December, she became the first British sovereign to attend a peacetime Cabinet meeting since George III in 1781. The Queen, who opened the 1976 Summer Olympics in Montreal, also opened the 2012 Summer Olympics and Paralympics in London, making her the first head of state to open two Olympic Games in two countries. For the London Olympics, she played herself in a short film as part of the opening ceremony, alongside Daniel Craig as James Bond. On 4 April 2013, she received an honorary BAFTA for her patronage of the film industry and was called "the most memorable Bond girl yet" at the award ceremony. On 3 March 2013, Elizabeth was admitted to King Edward VII's Hospital as a precaution after developing symptoms of gastroenteritis. She returned to Buckingham Palace the following day. A week later, she signed the new Commonwealth charter. Because of her age and the need for her to limit travelling, in 2013 she chose not to attend the biennial meeting of Commonwealth heads of government for the first time in 40 years. She was represented at the summit in Sri Lanka by her son, Prince Charles. She had cataract surgery in May 2018. In March 2019, she opted to give up driving on public roads, largely as a consequence of a car crash involving her husband two months beforehand. The Queen surpassed her great-great-grandmother, Queen Victoria, to become the longest-lived British monarch on 21 December 2007, and the longest-reigning British monarch and longest-reigning queen regnant and female head of state in the world on 9 September 2015. She is also the "longest-reigning sovereign in Canada's modern era". (King Louis XIV of France reigned over Canada (New France) for longer than Elizabeth.) She became the oldest current monarch after King Abdullah of Saudi Arabia died on 23 January 2015. She later became the longest-reigning current monarch and the longest-serving current head of state following the death of King Bhumibol of Thailand on 13 October 2016, and the oldest current head of state on the resignation of Robert Mugabe on 21 November 2017. On 6 February 2017, she became the first British monarch to commemorate a Sapphire Jubilee, and on 20 November, she was the first British monarch to celebrate a platinum wedding anniversary. Prince Philip had retired from his official duties as the Queen's consort in August. The Queen does not intend to abdicate, though Prince Charles is expected to take on more of her duties as Elizabeth, who celebrated her 93rd birthday in 2019, carries out fewer public engagements. On 20 April 2018, the government leaders of the Commonwealth of Nations announced that she will be succeeded by Prince Charles as head of the Commonwealth. The Queen stated it was her "sincere wish" that the Prince of Wales would follow her in the role. Plans for her death and funeral have been extensively prepared by most British government and media organisations for decades. To many of us, our beliefs are of fundamental importance. For me the teachings of Christ and my own personal accountability before God provide a framework in which I try to lead my life. I, like so many of you, have drawn great comfort in difficult times from Christ's words and example. She is patron of over 600 organisations and charities. Her main leisure interests include equestrianism and dogs, especially her Pembroke Welsh Corgis. Her lifelong love of corgis began in 1933 with Dookie, the first corgi owned by her family. Scenes of a relaxed, informal home life have occasionally been witnessed; she and her family, from time to time, prepare a meal together and do the washing up afterwards. In the 1950s, as a young woman at the start of her reign, Elizabeth was depicted as a glamorous "fairytale Queen". After the trauma of the Second World War, it was a time of hope, a period of progress and achievement heralding a "new Elizabethan age". Lord Altrincham's accusation in 1957 that her speeches sounded like those of a "priggish schoolgirl" was an extremely rare criticism. In the late 1960s, attempts to portray a more modern image of the monarchy were made in the television documentary Royal Family and by televising Prince Charles's investiture as Prince of Wales. In public, she took to wearing mostly solid-colour overcoats and decorative hats, which allow her to be seen easily in a crowd. At her Silver Jubilee in 1977, the crowds and celebrations were genuinely enthusiastic, but in the 1980s, public criticism of the royal family increased, as the personal and working lives of Elizabeth's children came under media scrutiny. Elizabeth's popularity sank to a low point in the 1990s. Under pressure from public opinion, she began to pay income tax for the first time, and Buckingham Palace was opened to the public. Discontent with the monarchy reached its peak on the death of Diana, Princess of Wales, though Elizabeth's personal popularity and support for the monarchy rebounded after her live television broadcast to the world five days after Diana's death. In November 1999, a referendum in Australia on the future of the Australian monarchy favoured its retention in preference to an indirectly elected head of state. 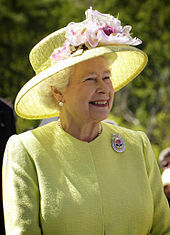 Polls in Britain in 2006 and 2007 revealed strong support for Elizabeth, and in 2012, her Diamond Jubilee year, approval ratings hit 90 percent. Referendums in Tuvalu in 2008 and Saint Vincent and the Grenadines in 2009 both rejected proposals to become republics. Elizabeth has been portrayed in a variety of media by many notable artists, including painters Pietro Annigoni, Peter Blake, Chinwe Chukwuogo-Roy, Terence Cuneo, Lucian Freud, Rolf Harris, Damien Hirst, Juliet Pannett, and Tai-Shan Schierenberg. Notable photographers of Elizabeth have included Cecil Beaton, Yousuf Karsh, Annie Leibovitz, Lord Lichfield, Terry O'Neill, John Swannell, and Dorothy Wilding. The first official portrait of Elizabeth was taken by Marcus Adams in 1926. Elizabeth's personal fortune has been the subject of speculation for many years. In 1971 Jock Colville, her former private secretary and a director of her bank, Coutts, estimated her wealth at £2 million (equivalent to about £28 million in 2018). In 1993, Buckingham Palace called estimates of £100 million "grossly overstated". In 2002, she inherited an estate worth an estimated £70 million from her mother. The Sunday Times Rich List 2017 estimated her personal wealth at £360 million, making her the 329th richest person in the UK. The Royal Collection, which includes thousands of historic works of art and the Crown Jewels, is not owned by the Queen personally but is held in trust, as are her official residences, such as Buckingham Palace and Windsor Castle, and the Duchy of Lancaster, a property portfolio valued at £472 million in 2015. Sandringham House and Balmoral Castle are personally owned by the Queen. The British Crown Estate—with holdings of £12 billion in 2016—is held in trust and cannot be sold or owned by Elizabeth in a personal capacity. 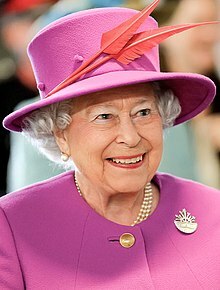 Elizabeth has held many titles and honorary military positions throughout the Commonwealth, is Sovereign of many orders in her own countries, and has received honours and awards from around the world. In each of her realms she has a distinct title that follows a similar formula: Queen of Jamaica and her other realms and territories in Jamaica, Queen of Australia and her other realms and territories in Australia, etc. In the Channel Islands and Isle of Man, which are Crown dependencies rather than separate realms, she is known as Duke of Normandy and Lord of Mann, respectively. Additional styles include Defender of the Faith and Duke of Lancaster. When in conversation with the Queen, the practice is to initially address her as Your Majesty and thereafter as Ma'am. From 21 April 1944 until her accession, Elizabeth's arms consisted of a lozenge bearing the royal coat of arms of the United Kingdom differenced with a label of three points argent, the centre point bearing a Tudor rose and the first and third a cross of St George. Upon her accession, she inherited the various arms her father held as sovereign. The Queen also possesses royal standards and personal flags for use in the United Kingdom, Canada, Australia, New Zealand, Jamaica, Barbados, and elsewhere. ^ See Queen's Official Birthday for an explanation of why Elizabeth II's official birthdays are not on the same day as her actual one. ^ As a constitutional monarch, the Queen is head of state, but her executive powers are limited by constitutional rules. ^ Her godparents were: King George V and Queen Mary; Lord Strathmore; Prince Arthur, Duke of Connaught and Strathearn (her paternal great-granduncle); Princess Mary, Viscountess Lascelles (her paternal aunt); and Lady Elphinstone (her maternal aunt). 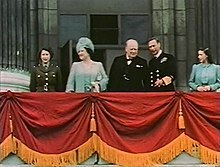 ^ Television coverage of the coronation was instrumental in boosting the medium's popularity; the number of television licences in the United Kingdom doubled to 3 million, and many of the more than 20 million British viewers watched television for the first time in the homes of their friends or neighbours. In North America, just under 100 million viewers watched recorded broadcasts. ^ Canada has used three versions of the arms during her reign. This version was used between 1957 and 1994. ^ Her full name can be seen on her marriage certificate, which is signed by both her and her father. ^ "Britain's monarchy". The Guardian. 16 May 2002. ^ a b "Her Majesty The Queen: Early life and education". Royal Household. 29 December 2015. Retrieved 18 April 2016. ^ Warwick, Christopher (2002). Princess Margaret: A Life of Contrasts. London: Carlton Publishing Group. p. 102. ISBN 978-0-233-05106-2. ^ "Queen Elizabeth the Queen Mother". Royal Household. 21 December 2015. Retrieved 18 April 2016. ^ a b "Children's Hour: Princess Elizabeth". BBC. 13 October 1940. Retrieved 22 July 2009. ^ "Early public life". Royal Household. Archived from the original on 28 March 2010. Retrieved 20 April 2010. ^ "No. 36973". The London Gazette (Supplement). 6 March 1945. p. 1315. ^ "No. 37205". The London Gazette (Supplement). 31 July 1945. p. 3972. ^ Rothman, Lily (25 May 2018). "The World War II Auto Mechanic in This Photo Is Queen Elizabeth II. Here's the Story Behind the Picture". Time. ^ "Royal plans to beat nationalism". BBC News. 8 March 2005. Retrieved 15 June 2010. ^ "Gorsedd of the Bards". National Museum of Wales. Archived from the original on 18 May 2014. Retrieved 17 December 2009. ^ "A speech by the Queen on her 21st birthday". Royal Household. 20 April 1947. Retrieved 18 April 2016. ^ Edwards, Phil (31 October 2000). "The Real Prince Philip". Channel 4. Archived from the original on 9 February 2010. Retrieved 23 September 2009. ^ Davies, Caroline (20 April 2006). "Philip, the one constant through her life". The Daily Telegraph. London. Retrieved 23 September 2009. ^ "No. 38128". The London Gazette. 21 November 1947. p. 5495. ^ a b "60 Diamond Wedding anniversary facts". Royal Household. 18 November 2007. Archived from the original on 3 December 2010. Retrieved 20 June 2010. ^ Soames, Emma (1 June 2012). "Emma Soames: As Churchills we're proud to do our duty". Retrieved 12 March 2019. ^ "No. 41948". The London Gazette (Supplement). 5 February 1960. p. 1003. ^ "Princess Margaret". Royal Household. 21 December 2015. Retrieved 18 April 2016. ^ "50 facts about The Queen's Coronation". Royal Household. 25 May 2003. Retrieved 18 April 2016. ^ Cotton, Belinda; Ramsey, Ron. "By appointment: Norman Hartnell's sample for the Coronation dress of Queen Elizabeth II". National Gallery of Australia. Archived from the original on 29 June 2011. Retrieved 4 December 2009. ^ "The Commonwealth: Gifts to the Queen". Royal Collection Trust. Retrieved 20 February 2016. ^ "Australia: Royal visits". Royal Household. 13 October 2015. Retrieved 18 April 2016. "New Zealand: Royal visits". Royal Household. 22 December 2015. Retrieved 18 April 2016. ^ Campbell, Sophie (11 May 2012). "Queen's Diamond Jubilee: Sixty years of royal tours". The Telegraph. Retrieved 20 February 2016. ^ Thomson, Mike (15 January 2007). "When Britain and France nearly married". BBC News. Retrieved 14 December 2009. ^ a b "Queen and Canada: Royal visits". Royal Household. Archived from the original on 4 May 2010. Retrieved 12 February 2012. ^ Speaight, Robert (1970). Vanier, Soldier, Diplomat, Governor General: A Biography. London: William Collins, Sons and Co. Ltd. ISBN 978-0-00-262252-3. ^ Dubois, Paul (12 October 1964). "Demonstrations Mar Quebec Events Saturday". The Gazette. p. 1. Retrieved 6 March 2010. ^ Dymond, Glenn (5 March 2010). "Ceremonial in the House of Lords" (PDF). House of Lords Library. p. 12. Retrieved 5 June 2010. ^ a b c d e Heinricks, Geoff (29 September 2000). "Trudeau: A drawer monarchist". National Post. Toronto. p. B12. ^ "Queen's 'fantasy assassin' jailed". BBC News. 14 September 1981. Retrieved 21 June 2010. ^ McNeilly, Hamish (1 March 2018). "Intelligence documents confirm assassination attempt on Queen Elizabeth in New Zealand". The Sydney Morning Herald. Retrieved 1 March 2018. ^ Ainge Roy, Eleanor (13 January 2018). "'Damn ... I missed': the incredible story of the day the Queen was nearly shot". The Guardian. Retrieved 1 March 2018. ^ a b Geddes, John (2012). "The day she descended into the fray". Maclean's (Special Commemorative Edition: The Diamond Jubilee: Celebrating 60 Remarkable years ed. ): 72. ^ a b MacQueen, Ken; Treble, Patricia (2012). "The Jewel in the Crown". Maclean's (Special Commemorative Edition: The Diamond Jubilee: Celebrating 60 Remarkable years ed. ): 43–44. ^ "Annus horribilis speech". Royal Household. 24 November 1992. Retrieved 18 April 2016. ^ Stanglin, Doug (18 March 2010). "German study concludes 25,000 died in Allied bombing of Dresden". USA Today. Retrieved 19 March 2010. ^ MORI poll for The Independent newspaper, March 1996, quoted in Pimlott, p. 578 and O'Sullivan, Jack (5 March 1996). "Watch out, the Roundheads are back". The Independent. Retrieved 17 September 2011. ^ a b "A speech by The Queen on her Golden Wedding Anniversary". The Royal Household. 20 November 1997. Retrieved 10 February 2017. ^ "Queen cancels visit due to injury". BBC News. 26 October 2006. Retrieved 8 December 2009. ^ Alderson, Andrew (28 May 2007). "Revealed: Queen's dismay at Blair legacy". The Telegraph. Retrieved 31 May 2010. ^ Alderson, Andrew (27 May 2007). "Tony and Her Majesty: an uneasy relationship". The Telegraph. Retrieved 31 May 2010. ^ "Queen celebrates diamond wedding". BBC News. 19 November 2007. Retrieved 10 February 2017. ^ "Historic first for Maundy service". BBC News. 20 March 2008. Retrieved 12 October 2008. ^ "A speech by the Queen to the United Nations General Assembly". Royal Household. 6 July 2010. Retrieved 18 April 2016. ^ a b "Queen addresses UN General Assembly in New York". BBC News. 7 July 2010. Retrieved 7 July 2010. ^ "Royal tour of Australia: The Queen ends visit with traditional 'Aussie barbie'". The Telegraph. 29 October 2011. Retrieved 30 October 2011. ^ "The Queen's Diamond Jubilee message". Royal Household. 6 February 2012. Retrieved 18 April 2016. ^ "Prince Harry pays tribute to the Queen in Jamaica". BBC News. 7 March 2012. Retrieved 31 May 2012. ^ "Their Royal Highnesses The Prince of Wales and The Duchess of Cornwall to Undertake a Royal Tour of Canada in 2012". Office of the Governor General of Canada. 14 December 2011. Retrieved 31 May 2012. ^ "Event News". The Queen's Diamond Jubilee Beacons. Retrieved 28 April 2016. ^ Rayner, Gordon (19 November 2012). "Queen and Duke of Edinburgh celebrate 65th wedding anniversary". The Daily Telegraph. Retrieved 10 February 2017. ^ "UK to name part of Antarctica Queen Elizabeth Land". BBC News. 18 December 2012. Retrieved 6 April 2013. ^ "Canada's Olympic Broadcast Media Consortium Announces Broadcast Details for London 2012 Opening Ceremony, Friday". PR Newswire. 24 July 2012. Archived from the original on 2 April 2015. Retrieved 22 March 2015. ^ Brown, Nicholas (27 July 2012). "How James Bond whisked the Queen to the Olympics". BBC News. Retrieved 27 July 2012. ^ "Queen honoured with Bafta award for film and TV support". BBC News. 4 April 2013. Retrieved 7 April 2013. ^ "Queen leaves hospital after stomach bug". BBC News. 4 March 2013. Retrieved 4 March 2013. ^ "Recovering Queen signs Commonwealth charter". BBC News. 11 March 2013. Retrieved 23 October 2016. ^ "Queen to miss Commonwealth meeting". BBC News. 7 May 2013. Retrieved 7 May 2013. ^ "The Queen undergoes eye surgery to remove cataract". ^ "Queen slams brakes on driving in public". The Times. 31 March 2019. Retrieved 31 March 2019. ^ "Elizabeth Set to Beat Victoria's Record as Longest Reigning Monarch in British History". HuffPost. 6 September 2014. Retrieved 28 September 2014. ^ Modh, Shrikant (11 September 2015). "The Longest Reigning Monarch Queen Elizabeth II". Philately News. Archived from the original on 1 December 2017. Retrieved 20 November 2017. ^ "Enthralling 'Audience' puts Britain's queen in room with politicians". Chicago Sun-Times. 24 August 2017. Retrieved 20 November 2017. ^ "Governor General to Host Special Event in Honour of Her Majesty's Historic Reign". Office of the Secretary to the Governor General. 9 September 2015. Retrieved 9 September 2015. ^ "Crown". Government of Canada. 19 July 2017. Retrieved 15 October 2017. ^ "Queen Elizabeth II is now world's oldest monarch". The Hindu. 24 January 2015. Retrieved 20 November 2017. ^ Rayner, Gordon (23 January 2015). "Queen becomes world's oldest monarch following death of King Abdullah of Saudi Arabia". The Telegraph. Retrieved 20 November 2017. ^ "Thailand's King Bhumibol Adulyadej dies at 88". BBC News. 13 October 2016. Retrieved 13 October 2016. ^ PA (13 October 2016). "Queen takes over longest reign mantle after Thailand's King Bhumibol dies". AOL (UK). Retrieved 13 October 2016. ^ Proctor, Charlie (21 November 2017). "BREAKING: The Queen becomes the world's oldest living Head of State following Mugabe resignation". Royal Central. Retrieved 21 November 2017. ^ "Queen Elizabeth II will be the world's oldest head of state if Robert Mugabe is toppled". msn.com. 14 November 2017. Archived from the original on 15 November 2017. Retrieved 20 November 2017. ^ Rayner, Gordon (29 January 2017). "The Blue Sapphire Jubilee: Queen will not celebrate 65th anniversary but instead sit in 'quiet contemplation' remembering father's death". The Telegraph. Retrieved 3 February 2017. ^ "Queen and Prince Philip portraits released to mark 70th anniversary". The Guardian. Press Association. 20 November 2017. Retrieved 20 November 2017. ^ Bilefsky, Dan (2 August 2017). "Prince Philip Makes His Last Solo Appearance, After 65 Years in the Public Eye". The New York Times. Retrieved 4 August 2017. ^ Mansey, Kate; Leake, Jonathan; Hellen, Nicholas (19 January 2014). "Queen and Charles start to 'job-share'". The Sunday Times. Retrieved 20 January 2014. ^ "Charles to be next Commonwealth head". BBC News. 20 April 2018. Retrieved 21 April 2018. ^ Knight, Sam (16 March 2017). "Operation London Bridge: the secret plan for the days after the Queen's death". The Guardian. Retrieved 17 March 2017. ^ However, occasionally claims are made about her political opinions. For example after the Scottish independence referendum, 2014, the then Prime Minister, David Cameron, claimed that Elizabeth was pleased with the outcome ( Dominiczak, Peter (24 September 2014). "David Cameron: I'm extremely sorry for saying Queen 'purred' over Scottish Independence vote". The Daily Telegraph. ). ^ "Queen 'will do her job for life'". BBC News. 19 April 2006. Retrieved 4 February 2007. ^ "How we are organised". Church of Scotland. Retrieved 4 August 2011. ^ "Queen meets Pope Francis at the Vatican". BBC News. 3 April 2014. Retrieved 28 March 2017. ^ "Christmas Broadcast 2000". Royal Household. 25 December 2000. Retrieved 18 April 2016. ^ "About The Patron's Lunch". The Patron's Lunch. 5 September 2014. Retrieved 28 April 2016. ^ "80 facts about The Queen". Royal Household. Archived from the original on 21 March 2009. Retrieved 20 June 2010. ^ Bush, Karen (26 October 2007). Everything Dogs Expect You To Know. London: New Holland Publishers. p. 115. ISBN 978-1-84537-954-4. Retrieved 18 September 2012. ^ Pierce, Andrew (1 October 2007). "Hug for Queen Elizabeth's first corgi". The Telegraph. Retrieved 21 September 2012. ^ Delacourt, Susan (25 May 2012). "When the Queen is your boss". Toronto Star. Retrieved 27 May 2012. ^ Cartner-Morley, Jess (10 May 2007). "Elizabeth II, belated follower of fashion". The Guardian. London. Retrieved 5 September 2011. ^ "Monarchy poll". Ipsos MORI. April 2006. Retrieved 22 March 2015. "Monarchy Survey" (PDF). Populus Ltd. 14–16 December 2007. p. 9. Archived from the original (PDF) on 11 May 2011. Retrieved 17 August 2010. "Poll respondents back UK monarchy". BBC News. 28 December 2007. Retrieved 17 August 2010. ^ "Monarchy/Royal Family Trends – Satisfaction with the Queen". Ipsos MORI. 19 May 2016. Retrieved 19 September 2017. ^ "Vincies vote "No"". BBC News. 26 November 2009. Retrieved 26 November 2009. ^ Riley, Ben (12 February 2016). "Revealed: Damien Hirst's only portrait of the Queen found in government archives". The Telegraph. Retrieved 10 September 2016. ^ "Elizabeth II". National Portrait Gallery. Retrieved 22 June 2013. ^ "Marcus Adams". National Portrait Gallery. Retrieved 20 April 2013. ^ "Queen inherits Queen Mother's estate". BBC News. 17 May 2002. Retrieved 25 December 2015. ^ a b "Rich List 2017". The Sunday Times. 7 May 2017. Archived from the original on 20 August 2017. Retrieved 19 August 2017. ^ "FAQs". Royal Collection. Retrieved 29 March 2012. "The Royal Collection". Royal Household. 20 November 2015. Retrieved 18 April 2016. ^ a b "The Royal Residences: Overview". Royal Household. Archived from the original on 1 May 2011. Retrieved 9 December 2009. ^ "Accounts, Annual Reports and Investments". Duchy of Lancaster. 2015. Archived from the original on 24 August 2017. Retrieved 19 August 2017. ^ "FAQs". Crown Estate. Retrieved 22 March 2015. ^ "Greeting a member of The Royal Family". Royal Household. 15 January 2016. Retrieved 18 April 2016. 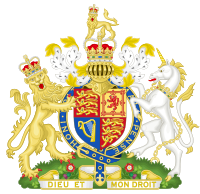 ^ "Coat of Arms: Her Royal Highness The Princess Elizabeth". Lieutenant Governor of British Columbia. Archived from the original on 6 November 2013. Retrieved 6 April 2013. ^ "Personal flags". Royal Household. 15 January 2016. Retrieved 18 April 2016. ^ "Coat of Arms of Canada". Royal Heraldry Society of Canada. 5 February 2009. Archived from the original on 30 January 2012. Retrieved 13 March 2011. ^ Louda, Jiří; Maclagan, Michael (1999) . Lines of Succession: Heraldry of the Royal Families of Europe (2nd ed.). London: Little, Brown. p. 34. ISBN 978-0-316-84820-6. "Archival material relating to Elizabeth II". UK National Archives. The generations indicate descent from George I, who formalised the use of the titles prince and princess for members of the British royal family. Where a princess may have been or is descended from George I more than once, her most senior descent, by which she bore or bears her title, is used. 1 Status debatable; see her article. This page was last edited on 20 April 2019, at 23:02 (UTC).